Sitting in the backseat of a small, bright, cherry red Chevy Cruz, I fought back the feelings of unease and nausea. The endless stream of rapid fire stopping mixed with sudden jolts of speed left my stomach sloshing around today’s lunch. I lost count of all the times lanes were switched mindlessly without prior thought or a cursory check of the blind spots. Two sets of car brakes in both the driver and passenger seats created an added teetertotter motion I hadn’t felt outside the pirate ship that rocked wildly back and forth at a local county fair. After an hour and 40 minutes, I emerged from the backseat of the car victorious having survived my son’s first driver’s ed lesson. I love that my son asked me to ride along in his first ever extended road course training when he didn’t have to, and as his father, my heart swims with pride. He is a truly smart and thoughtful young man who asks insightful questions about driving while he tries to figure out how to properly navigate his car. Cautious and patient, he puts the time in to learn this craft that those decades his senior take for granted as second nature. Are we ready for what is next? Nevertheless, my first thought was – when do we get autonomous or driverless cars? Learning how to drive isn’t easy, it isn’t for the faint of heart and it’s downright dangerous to everyone on the road. As luck would have it, we recently recorded a podcast with Dr. Lina Karam of Arizona State University. Dr. Karam is heading up ASU’s newly announced driverless car initiative and is in the middle of the blending of technology and implementation to make this vision a reality. (To hear her complete interview, be sure to listen to our podcast.) In short – the driverless car technology is ready now. She believes we all could be driving around in autonomous vehicles (AV) today (assuming cost wasn’t an issue). So, are we accident free in the future? If we have autonomous vehicles on the road, will this mean that we won’t see car accidents anymore? Most experts agree that AVs should be able to eliminate human-error accidents. However, the experts we spoke to believe that the transition from human-driven cars to AVs may cause an increase in crashes as human drivers figure out how to adapt to sharing the road with autonomous cars. This begs another question: if we see far fewer accidents on the road, what will be the impact on auto insurance? The primary driver behind auto insurance premiums is based on the measure of risk the driver presents, the price of the car and a consideration to the location of the car. 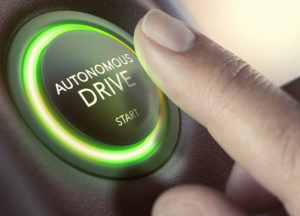 Experts from many sources indicate that with autonomous vehicles, lower premiums may be based on which carmaker has the safest driverless technology. Ride sharing becomes the norm? Will we get to the point where our automotive lives will more closely resemble the Uber/Lyft model in lieu of today’s current system? If society evolves into transportation as a service, the auto industry may more closely resemble the airline industry. The end customer may change from the drivers of cars to eventually the owner of the fleet of driverless cars. Auto manufactures will make cars for those who own massive amounts of autonomous vehicles. If that does happen, it makes sense that consumers would be more loyal to these fleet providers instead of a brand or model of car. This is like how many are already loyal to Lyft or Uber. In the future, car companies may exclusively sell to institutions like that by making cars they desire rather than considering the end user. It’s similar to how Boeing and Airbus make planes for the big airlines without asking about the desired features and benefits you may want when purchasing your round-trip fare for vacation. There are so many issues about autonomous vehicles, we could dedicate countless articles. The driving lessons with my new teenage driver reminded me that the need for driverless cars is immediate. I think my son will turn out to be a responsible and terrific driver one day in the future, but the sooner we can make the roads safer the better. Last year alone there were over 40,100 motor vehicle deaths, and no matter how terrific driving schools may be – the roads can still be a dangerous place to travel. Distracted driving is at an all-time high and all you need to do is look around at other cars while you are on the road to see how many people are on their phones while driving, despite the threat of tickets or other punishment. What other structural issues hold us back from truly starting to enjoy autonomous vehicle technology on grander scale? What about people who still want to drive when AVs come to the market? What will people be doing in their cars while cruising down the road? The future is an interesting topic to think about. Perhaps no other item is more controversial and more critical than the future of our transportation.